The PA leadership in Ramallah is leading the Palestinian movement of independence to a dead end with its proposed unilateral call for Palestinian statehood. From a rumor, to a rising murmur, the proposal floated by the Palestinian Authority’s (PA) Ramallah leadership to declare Palestinian statehood unilaterally has suddenly hit center stage. The European Union, the United States and others have rejected it as “premature,” but endorsements are coming from all directions: journalists, academics, nongovernmental organization activists, Israeli right-wing leaders (more on that later). The catalyst appears to be a final expression of disgust and simple exhaustion with the fraudulent “peace process” and the argument goes something like this: if we can’t get a state through negotiations, we will simply declare statehood and let Israel deal with the consequences. But it’s no exaggeration to propose that this idea, although well-meant by some, raises the clearest danger to the Palestinian national movement in its entire history, threatening to wall Palestinian aspirations into a political cul-de-sac from which it may never emerge. The irony is indeed that, through this maneuver, the PA is seizing — even declaring as a right — precisely the same dead-end formula that the African National Congress (ANC) fought so bitterly for decades because the ANC leadership rightly saw it as disastrous. That formula can be summed up in one word: Bantustan. It has become increasingly dangerous for the Palestinian national movement that the South African Bantustans remain so dimly understood. If Palestinians know about the Bantustans at all, most imagine them as territorial enclaves in which black South Africans were forced to reside yet lacked political rights and lived miserably. This partial vision is suggested by Mustafa Barghouthi’s recent comments at the Wattan Media Centre in Ramallah, when he cautioned that Israel wanted to confine the Palestinians into “Bantustans” but then argued for a unilateral declaration of Palestinian statehood within the 1967 boundaries — although nominal “states” without genuine sovereignty are precisely what the Bantustans were designed to be. Apartheid South Africa’s Bantustans were not simply sealed territorial enclaves for black people. They were the ultimate “grand” formula by which the apartheid regime hoped to survive: that is, independent states for black South Africans who — as white apartheid strategists themselves keenly understood and pointed out — would forever resist the permanent denial of equal rights and political voice in South Africa that white supremacy required. As designed by apartheid architects, the ten Bantustans were designed to correspond roughly to some of the historical territories associated with the various black “peoples” so that they could claim the term “Homelands.” This official term indicated their ideological purpose: to manifest as national territories and ultimately independent states for the various black African “peoples” (defined by the regime) and so secure a happy future for white supremacy in the “white” Homeland (the rest of South Africa). So the goal of forcibly transferring millions of black people into these Homelands was glossed over as progressive: 11 states living peacefully side by side (sound familiar?). The idea was first to grant “self-government” to the Homelands as they gained institutional capacity and then reward that process by declaring/granting independent statehood. The challenge for the apartheid government was then to persuade “self-governing” black elites to accept independent statehood in these territorial fictions and so permanently absolve the white government of any responsibility for black political rights. Toward this end, the apartheid regime hand-picked and seeded “leaders” into the Homelands, where they immediately sprouted into a nice crop of crony elites (the usual political climbers and carpet-baggers) that embedded into lucrative niches of financial privileges and patronage networks that the white government thoughtfully cultivated (this should sound familiar too). It didn’t matter that the actual territories of the Homelands were fragmented into myriad pieces and lacked the essential resources to avoid becoming impoverished labor cesspools. Indeed, the Homelands’ territorial fragmentation, although crippling, was irrelevant to Grand Apartheid. Once all these “nations” were living securely in independent states, apartheid ideologists argued to the world, tensions would relax, trade and development would flower, blacks would be enfranchised and happy, and white supremacy would thus become permanent and safe. The thorn in this plan was to get even thoroughly co-opted black Homeland elites to declare independent statehood within “national” territories that transparently lacked any meaningful sovereignty over borders, natural resources, trade, security, foreign policy, water — again, sound familiar? Only four Homeland elites did so, through combinations of bribery, threats and other “incentives.” Otherwise, black South Africans didn’t buy it and the ANC and the world rejected the plot whole cloth. (The only state to recognize the Homelands was fellow-traveler Israel.) But the Homelands did serve one purpose — they distorted and divided black politics, created terrible internal divisions, and cost thousands of lives as the ANC and other factions fought it out. The last fierce battles of the anti-apartheid struggle were in the Homelands, leaving a legacy of bitterness to this day. Hence the supreme irony for Palestinians today is that the most urgent mission of apartheid South Africa — getting the indigenous people to declare statehood in non-sovereign enclaves — finally collapsed with mass black revolt and took apartheid down with it, yet the Palestinian leadership now is not only walking right into that same trap but actually making a claim on it. The reasons that the PA-Ramallah leadership and others want to walk into this trap are fuzzy. Maybe it could help the “peace talks” if they are redefined as negotiations between two states instead of preconditions for a state. Declaring statehood could redefine Israel’s occupation as invasion and legitimize resistance as well as trigger different and more effective United Nations intervention. Maybe it will give Palestinians greater political leverage on the world stage — or at least preserve the PA’s existence for another (miserable) year. Why these fuzzy visions are not swiftly defeated by short attention to the South African Bantustan experience may stem partly from two key differences that confuse the comparison, for Israel has indeed sidestepped two infamous fatal errors that helped sink South Africa’s Homeland strategy. First, Israel did not make South Africa’s initial mistake of appointing “leaders” to run the Palestinian “interim self-governing” Homeland. In South Africa, this founding error made it too obvious that the Homelands were puppet regimes and exposed the illegitimacy of the black “national” territories themselves as contrived racial enclaves. 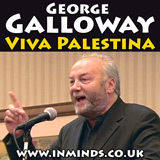 Having watched the South Africans bungle this, and having learned from its own past failures with the Village Leagues and the like, Israel instead worked with the United States to design the Oslo process not only to restore the exiled leadership of the Palestine Liberation Organization (PLO) and its then Chairman Yasser Arafat to the territories but also to provide for “elections” (under occupation) to grant a thrilling gloss of legitimacy to the Palestinian “interim self-governing authority.” It’s one of the saddest tragedies of the present scenario that Israel so deftly turned Palestinians’ noble commitment to democracy against them in this way — granting them the illusion of genuinely democratic self-government in what everyone now realizes was always secretly intended to be a Homeland. The last card the Palestinians can play — their real claim on the world’s conscience, the only real threat they can raise to Israel’s status quo of occupation and settlement — is their statelessness. 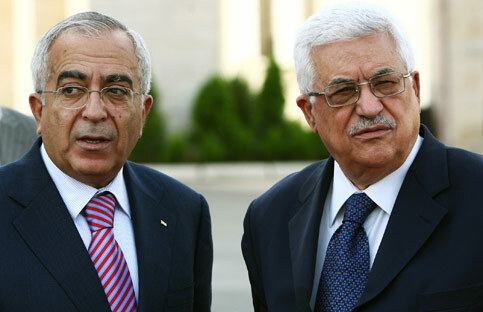 The PA-Ramallah leadership has thrown away all the other cards. It has stifled popular dissent, suppressed armed resistance, handed over authority over vital matters like water to “joint committees” where Israel holds veto power, savagely attacked Hamas which insisted on threatening Israel’s prerogatives, and generally done everything it can to sweeten the occupier’s mood, preserve international patronage (money and protection), and solicit promised benefits (talks?) that never come. 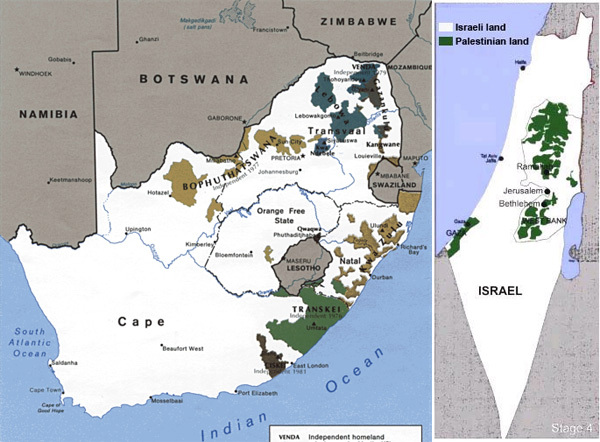 Only now has Israel found a way to avoid South Africa’s second fatal error, which was to declare black Homelands to be “independent states” in non-sovereign territory. In South Africa, this ploy manifested to the world as transparently racist and was universally disparaged. It must be obvious that, if Israel had stood up in the international stage and said “as you are, you are now a state” that Palestinians and everyone else would have rejected the claim out of hand as a cruel farce. Yet getting the Palestinians to declare statehood themselves allows Israel precisely the outcome that eluded the apartheid South African regime: voluntary native acceptance of “independence” in a non-sovereign territory with no political capacity to alter its territorial boundaries or other essential terms of existence — the political death capsule that apartheid South Africa could not get the ANC to swallow. Responses from Israel have been mixed. The government does seem jumpy and has broadcast its “alarm,” Foreign Minister Avigdor Lieberman has threatened unilateral retaliation (unspecified) and government representatives have flown to various capitals securing international rejection. 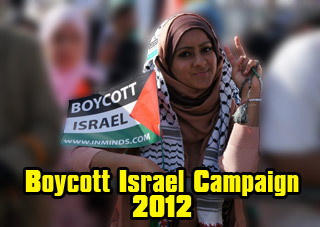 But Israeli protests could also be disingenuous. One tactic could be persuading worried Palestinian patriots that a unilateral declaration of statehood might not be in Israel’s interest in order to allay that very suspicion. Another is appeasing protest from that part of Likud’s purblind right-wing electorate that finds the term “Palestinian state” ideologically anathema. A more honest reaction could be the endorsement of Kadima party elder Shaul Mofaz, a hardliner who can’t remotely be imagined to value a stable and prosperous Palestinian future. Right-wing Israeli journalists are also pitching in with disparaging but also comforting essays arguing that unilateral statehood won’t matter because it won’t change anything (close to the truth). For example, Prime Minister Benjamin Netanyahu has threatened unilaterally to annex the West Bank settlement blocs if the PA declares statehood, but Israel was going to do that anyway. In the liberal-Zionist camp, Yossi Sarid has warmly endorsed the plan and Yossi Alpher has cautiously done so. Their writings suggest the same terminal frustration with the “peace process” but also recognition that this may be the only way to save the increasingly fragile dream that a nice liberal democratic Jewish state can survive as such. It also sounds like something that might please Palestinians — at least enough to finally get their guilt-infusing story of expulsion and statelessness off the liberal-Zionist conscience. Well-meaning white liberals in apartheid South Africa — yes, there were some of those, too — held the same earnest candle burning for the black Homelands system. Some otherwise smart journalists are also pitching in to endorse unilateral statehood, raising odd ill-drawn comparisons — Georgia, Kosovo, Israel itself — as “evidence” that it’s a good idea. But Georgia, Kosovo and Israel had entirely different profiles in international politics and entirely different histories from Palestine and attempts to draw these comparisons are intellectually lazy. The obvious comparison is elsewhere and the lessons run in the opposite direction: for a politically weak and isolated people, who have never had a separate state and lack any powerful international ally, to declare or accept “independence” in non-contiguous and non-sovereign enclaves encircled and controlled by a hostile nuclear power can only seal their fate. In fact, the briefest consideration should instantly reveal that a unilateral declaration of statehood will confirm the Palestinians’ presently impossible situation as permanent. As Mofaz predicted, a unilateral declaration will allow “final status” talks to continue. What he did not spell out is that those talks will become truly pointless because Palestinian leverage will be reduced to nothing. As Middle East historian Juan Cole recently pointed out, the last card the Palestinians can play — their real claim on the world’s conscience, the only real threat they can raise to Israel’s status quo of occupation and settlement — is their statelessness. The PA-Ramallah leadership has thrown away all the other cards. It has stifled popular dissent, suppressed armed resistance, handed over authority over vital matters like water to “joint committees” where Israel holds veto power, savagely attacked Hamas which insisted on threatening Israel’s prerogatives, and generally done everything it can to sweeten the occupier’s mood, preserve international patronage (money and protection), and solicit promised benefits (talks?) that never come. It’s increasingly obvious to everyone watching from outside this scenario — and many inside it — that this was always a farce. For one thing, the Western powers do not work like the Arab regimes: when you do everything the West requires of you, you will wait in vain for favors, for the Western power then loses any benefit from dealing more with you and simply walks away. But more importantly, the South African comparison helps illuminate why the ambitious projects of pacification, “institution building” and economic development that the Ramallah PA and Prime Minister Salam Fayyad have whole-heartedly embarked upon are not actually exercises in “state-building.” Rather, they emulate with frightening closeness and consistency South Africa’s policies and stages in building the Bantustan/Homelands. Indeed, Fayyad’s project to achieve political stability through economic development is the same process that was openly formalized in the South African Homeland policy under the slogan “separate development.” That under such vulnerable conditions no government can exercise real power and “separate development” must equate with permanent extreme dependency, vulnerability and dysfunctionality was the South African lesson that has, dangerously, not yet been learned in Palestine — although all the signals are there, as Fayyad himself has occasionally admitted in growing frustration. But declaring independence will not solve the problem of Palestinian weakness; it will only concretize it. Still, when “separate development” flounders in the West Bank, as it must, Israel will face a Palestinian insurrection. So Israel needs to anchor one last linchpin to secure Jewish statehood before that happens: declare a Palestinian “state” and so reduce the “Palestinian problem” to a bickering border dispute between putative equals. In the back halls of the Knesset, Kadima political architects and Zionist liberals alike must now be waiting with bated breath, when they are not composing the stream of back-channel messages that is doubtless flowing to Ramallah encouraging this step and promising friendship, insider talks and vast benefits. For they all know what’s at stake, what every major media opinion page and academic blog has been saying lately: that the two-state solution is dead and Israel will imminently face an anti-apartheid struggle that will inevitably destroy Jewish statehood. So a unilateral declaration by the PA that creates a two-state solution despite its obvious Bantustan absurdities is now the only way to preserve Jewish statehood, because it’s the only way to derail the anti-apartheid movement that spells Israel’s doom. This is why it is so dangerous that the South African Bantustan comparison has been neglected until now, treated as a side issue, even an exotic academic fascination, by those battling to relieve starvation in Gaza and soften the cruel system of walls and barricades to get medicine to the dying. The Ramallah PA’s suddenly serious initiative to declare an independent Palestinian state in non-sovereign territory must surely force fresh collective realization that this is a terribly pragmatic question. It’s time to bring closer attention to what “Bantustan” actually means. The Palestinian national movement can only hope someone in its ranks undertakes that project as seriously as Israel has undertaken it before it’s too late. Virginia Tilley is a former professor of political science and international relations and since 2006 has served as Chief Research Specialist at the Human Sciences Research Council of South Africa. She is author of The One-State Solution (U of Michigan Press, 2005) and numerous articles and essays on the Israeli-Palestinian conflict. Based in Cape Town, she writes here in her personal capacity and can be reached at vtilley A T mweb D O T co D O T za. On 23rd Sept 2016 South Africa's Palestinian Solidarity Campaign, lead by Ronnie Kasrils, boldly protested against Israel's illegal policy of Administrative Detention outside the Israeli Trade Mission in Johannesburg. Inminds message of solidarity was read out at the protest. Tzipi Livni, one of the architects of the December 2008 slaughter of Gaza, cancelled her trip to South Africa after the Media Review Network and the Palestine Solidarity Alliance launched legal action to get a war crimes arrest warrant issued against her. South African luggage supplier Saley’s Travel Goods has refused to do business with the South African Zionist Federation for its continued support of Israeli apartheid.